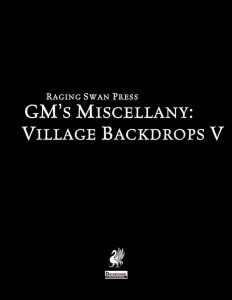 The fifth compilation of Village Backdrops clocks in at 89 pages, 1 page front cover, 1 page editorial, 1 page ToC, 1 page of SRD, 2 pages of advertisement, 1 page back cover, leaving us with 82 pages of content, so let’s take a look! This massive compilation includes the following villages: Black Wyvern, Bleakflat, Byrnfort, Dawnmarsh, Farrav’n, Lanthorn, Needlebriar, Quey’s Glade, Ronak, Skaalhaft, Suurin and Woodridge. I have written reviews for all of these villages, discussing them in detail, so if you require detailed guidance regarding the individual villages, you may want to check out these reviews. Since I loathe repeating myself, and the actual use of a number of Village Backdrop-reviews stringed together would be of dubious use, I will leave it at that. Now, in direct comparison to the individual pdfs, we get quite a few neat new pieces of b/w-artworks, and that alone is a big plus. Now, the villages, as a whole, are of the exceedingly high quality we expect to see from Raging Swan Press – no surprises there. However, it should be noted that this still is “just” a compilation – while this could have been used to fix the few more problematic components of some villages, the like has not happened. There is still mentioning of poisoning a plant creature, which RAW still doesn’t work in PFRPG. Similarly, the great magical lanterns of Lanthorn still remain opaque backdrops sans concrete rules. This is a compilation of files – nothing less, nothing more. Editing and formatting are very good on a formal and rules-language level. Layout adheres to a two-column b/w-standard, and the book features great b/w-artworks. The b/w-cartography by Tommi Salama and Maciej Zagorski is amazing. The pdf comes fully bookmarked and in two different versions – one optimized for screen use and one intended for printing out. I can’t comment on the print version, as I do not own it. John Bennett, Creighton Broadhurst, Jeff Gomez, Richard Green, David N. Ross, Amber Underwood and Mike Welham are all top-tier authors, and it shows in these settlements. The villages within are evocative, fun and cool – and yet. In direct comparison, the compilation has missed the opportunity of refining the less amazing villages within, updating and improving them, which would not have been hard. This compilation could have been one of the strongest in the long and storied history of high-quality backdrops in the series, a jewel. The lack of further refinement, however, does hurt the compilation somewhat. Don’t get me wrong – this is still a great book of backdrops, but it could have been a great one. My final verdict will clock in at 4.5 stars, rounded down for the purpose of this platform.